Hello everyone and thanks for stopping by! So, how was your week? Mine was crammed full of stuff I really didn't want to do - but had to do. Doctor's appointments, dentist appointments and a very long, very boring meeting I had to attend with my hubby. For those of you who didn't know this little tidbit about me....I am also a "Certified Pest Control Operator/Owner". Aren't you impressed? My hubby has owned and run our business for the last 28 years and after we had owned the business for a few years, I had to take the state test to become "Certified". Along with the certification comes yearly continuing education points. So - long story short - I spent 4 very long hours in a pest control continuing ed class yesterday...uuuuggghhh. Crafting hours that I can NEVER get back! Like I said...kinda messy...but I like it! * I'm not sure if you can see them, but there are a couple of black glittery spiders that I just hot glued right onto the ribbon. 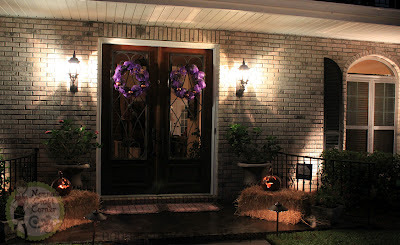 And, here's my front porch all decked out. I love these fun ceramic pumpkins that I found at Lowe's about a month ago. I may have to make another trip and pick up a couple more. My Lola was not very happy with me because I wouldn't let her come outside while I was trying to take pictures. She's so short, I had to keep clicking my camera to catch her as she jumped up to see out the door. I tried to get a night time pic. It didn't turn out very well, but you get the idea. 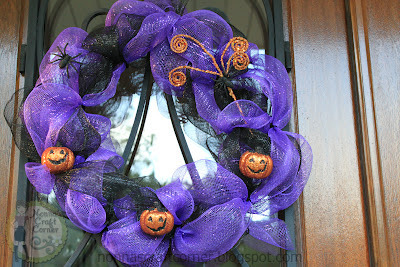 I am entering my wreaths into the very first challenge hosted by Nana over at My Crafting Channel - "The gh'oul times! Ok - I think I'll go see what else I can get finished - got lots of projects to finish up this weekend and I need to get busy. Thanks again for stopping by. I always appreciate your visits and your sweet comments. I'll be seeing you soon. Spiders, so he doesn't pull out the pest control spray . This turned out gorgeous!!! 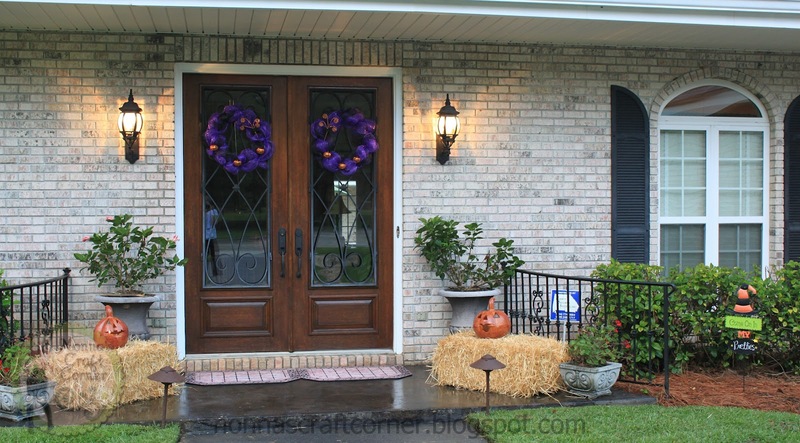 Love the colors you used and they look awesome on the front door!! Love the way they turned out. Perfect colors. This is gorgeous! You did a fabulous job and your first try...Wow, you rocked this:) GREAT job! Your little Lola is so stinken adorable! It is beautiful. I should try to make one of those, I'm with you, I am not paying that much for a wreath. Lola is very cute! Absolutely Stunning. I just love it. Oh, I LOVE this! Gorgeous! Oh Tanya, this looks incredible. If it's okay I may email you for some tips - I have wanted to make one of these too. I got all the stuff(winter theme) but just need a bit of instruction. Also, I think I've mentioned this before - I have a Lola too 4 lb yorkie and they could be twin sisters :) My Lola gets that same face! I think those wreaths are PERFECT! I would love to come to your door and see them. I just love this wreath. Great colors and the pumpkins are a perfect. Super cute! 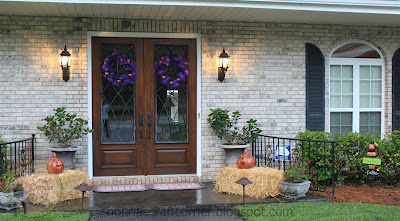 Love the purple ribbion and the glittery pumpkins:) By the way your dog is so cute! They look wonderful! Love the purple! I have seen some at the local M's, but they didn't look this great. I know what you mean about the meetings. I am going through that at work right now. Tanya ~ Oh I LOVE these wreaths!!! How COOL and PERFECT are they for the up coming holiday!! 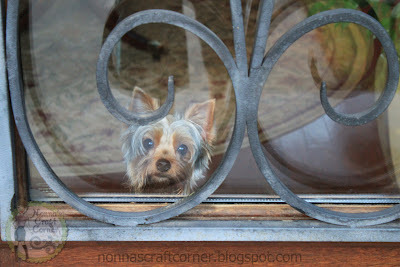 You know that little CUTIE behind the door ~ Eeek ~ ADORBS!!! OMG ~ I can't even imagine sitting there for 4 hours listening about bugs! Okay I know these aren't truely pest but how the heck do you get rid of spiders and stink bugs?? I find them PESTS!! LOL!! !